starring Franklin as the irrepressible Mrs. Murphy. (P.S. If you think I'm mapping any of the shots incorrectly, just let me know. Film Studies For Free is ten years old today! Yes! It was exactly one whole decade ago that it went public online for the first time, just a few weeks before the 2008 financial crash really took off... What a truly excellent time to have become the international purveyor of links to high-quality FREE stuff for film and screen media studies! The re-distributive, Open Access-championing, project that FSFF embraced had been conceived (of) a mere couple of weeks before, early one morning, in one of those rather dramatic lightbulb moments: "Wouldn't it be excellent if there could be a blog that directed film scholars to good, openly accessible resources for them online?" And thus it came to pass. What a blast it has been. 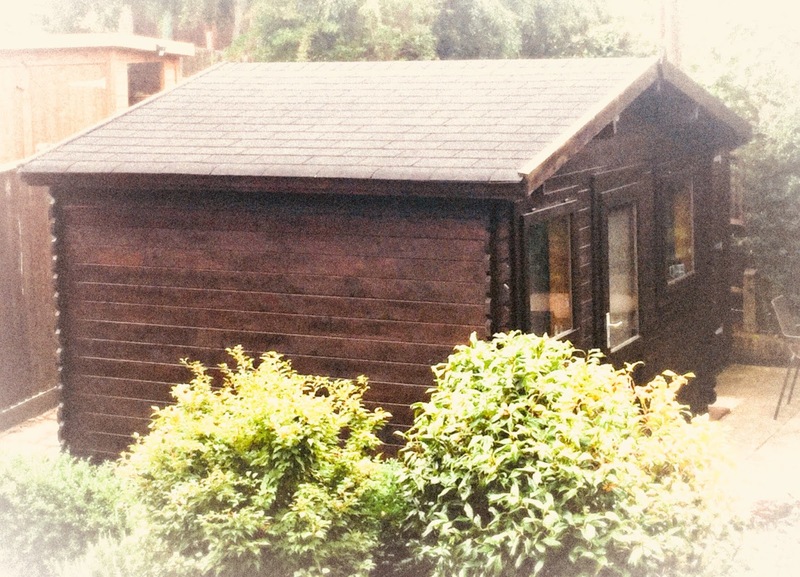 Brought to you from a somewhat remote log cabin in a tiny internationalist enclave of pre-Brexit Britain (pictured for the first time online, below), its mission was equally inspired by the extremely lively and considerably less corporate atmosphere, at the time, of the cinephile Web 2.0, post-the establishment of YouTube in 2005 - a fascinating period now both scrutinised and immortalised by fellow participant-observer in that era and since (and blogger and cinephile extraordinaire) Girish Shambu in his wonderful 2016 book The New Cinephilia. With no pomp or circumstance and—in the manner of an uncertain TV pilot episode—with very little sense of the form it would go on to take, on August 24, 2008, FSFF posted an inaugural entry on three 'very worthwhile items on the Director's Cut' (about which its scholar-author had recently been writing for a subsequently published book chapter). Oh, and FSFF embraced a hilarious third-person sense of humour and directed it at a virtual second-person audience... What writing larks it has had! Dear Reader, it has been a total pleasure. Please permit FSFF the indulgence of one final reflection on this anniversary. The experience of fun, energy and experimentalism in producing FSFF over the last decade has had some unimaginable and unintended consequences - unimaginable and unintended ten years ago, anyhow. They have been wonderful, too. If you want to read more about FSFF's thoughts on the above turns, there's a 2012 article by its author, a research dissertation about this blog based on interviews with her, a very recent and excellent interview reflecting on all the above, carried out by the fabulous film scholar Sérgio Dias Branco for the online journal Aniki, and tons more thoughts in publications listed here. This brings us back to OA business as usual: today's anniversary entry consists of the usual lists of links, below - this time to commemoratively-focused ones connected, of course, to FSFF's first decade of existence. But, FSFF also offers you, as is its wont, one video above and one below: two modest (film studies-oriented) tributes to the cinematic magic (in The Blues Bothers and Moonlight) of Aretha Franklin, the Queen of Soul, who sadly passed away on August 16, 2018. Keep coming back, Readers (well over 5 million of you, and still counting..). Thank you! And thank you very much, Open Access authors and publishers! Without you, FSFF really wouldn't exist... Would it? Please follow @filmstudiesff on Twitter and the Film Studies For Free page on Facebook, where quality links are shared daily. (and everything else) in every single way possible for each of the last great ten years. David Bordwell and Kristin Thompson, of course! Kevin B. Lee, more influential in relation to everything FSFF (and its author) does in the realm of online film and media studies than he could possibly imagine.... A true original! Henry Jenkins, still setting the standard for critical media studies online. Immense! Jonathan Rosenbaum, Matt Zoller Seitz, film (and TV) critic-authors of the film websites I enjoy reading the most. Also, the most generous. Chuck Tryon (The Chutry Experiment), took participant-observation in online digital media studies to a whole new level. Pam Cook, Katherine Groo (Half/Films), Chris Cagle (Category D), three of the smartest people in the film scholarly universe online. Nick Rombes, Shane Denson, Jason Mittell - thanks for all the manifold brilliant ideas! And for their wondrous film criticism blogging: Farran Smith Nehme / Marilyn Ferdinand / Roderick Heath (the backbone of the Film Preservation Blogathon in which FSFF participated in its earlier years). And last but not least Peter Nellhaus, especially for his dedication to (and huge knowledge about and love for) cinema beyond that which exists in the English language. Lantern, the search platform for the collections of the Media History Digital Library, an open access initiative led by David Pierce and Eric Hoyt. Oapen Books - not a publisher but a library, where you can find vast quantities of film and screen studies research in book form. Critical Commons (For Fair and Critical Participation in Media Culture). Thank you, Steve Anderson! Podcasts extraordinaires: The Cinephiliacs (Peter Labuza); The Cinematologists (Neil Fox and Dario Llinares); You Must Remember This (Karina Longworth); and relative newcomer, Eavesdropping at the Movies (José Arroyo and Michael Glass). New audiovisual essay by Cristina Álvarez López and Adrian Martin: The Gauntlet - Place and Space in a Scene from Notorious. Hollywood in Color [podcast] 'looks at the history of film through the lens of the underappreciated minority actresses who came up through the ranks.' Thanks to Liz Greene for the link. Film critic and scholar extraordinaire Adrian Martin is the latest guest (no. 41) on Bill Ackerman's podcast series SUPPORTING CHARACTERS! Bill's questions (more or less the same that he asks each person featured) tend to focus on autobiography, early years, career matters, and so on. Many films are also mentioned along the way. Is there a blog in this class? 2018 - the annual roundup by David Bordwell and Kristin Thompson of lists of suggestions of posts at Observations on Film Art that might be useful in classes, either as assignments or recommendations. Top notch film scholar Caetlin Benson-Allott on the recent Oscar developments. Latest issue of the online journal APPARATUS on the influence of women on Eastern European film form, their significance, their skills, and their expertise, through their work as editors and beyond. Martin Eve and Caroline Edwards, for the amazing Open Library of Humanities, a platform now graced by a new film and television studies journal called Open Screens! Adrian Martin, for the personal example of his prolific sharing of his work online and for editing and producing numerous open access publishing ventures (including Screening the Past, Rouge, and Lola [with Girish Shambu]). Check out his phenomenal personal website, supported by the open access legend that is Bill Mousoulis. Thomas Elsaesser, for the personal example of his prolific sharing of his work online and for editing and supporting numerous open access publishing ventures. Check out his phenomenal personal website. Thanks to him, also, for helping to pioneer the audiovisual essay form. Jeroen Sondervan, for all his work at Amsterdam University Press, and beyond, supporting open-access books and journals. Check out his latest great contribution, the Open Access Media Scholar website. And don't forget Oapen Books - not a publisher but a library, where you can find vast quantities of film and screen studies research in book form. I think I discovered [Film Studies For Free] around 2010-2011. And I'm pretty sure it was through Catherine's video essay 'True Likeness', that we republished at Transit. Cine y otros desvíos - (cinentransit.com). Lovely piece and long life to Film Studies For Free!!! [W]ith thanks for such invaluable work and hearty congratulations on the anniversary. I remember when I first discovered [Film Studies For Free]-- I think I just came across it via a film-related google search, but it was a revelation. It was as if someone had given me a gift... The site was relatively new, but already, one could get deliriously, delightfully lost in it for hours. Here’s my memory [...]. [Film Studies For Free] was one of my first resources when I was getting into film, especially as I started university (a Filmmaking degree) and realized that I wasn’t going to have Film History as a subject. I was also really struggling with trying to be fluent in reading and writing in English. The complex language of some of the studies pushed me into studying more, finding new words, new thoughts and it also gave me the education that I was lacking at uni. I’ve always been thankful for the access provided and I’ll always have the memories of going through link after link, reading about films that I hadn’t seen yet, going back, watching more and more, and then reading. Can’t say it made me want to write those kind of studies (I wish I had that kind of mentality and verbosity). But it surely made me write more about film and eventually, down the line, jump in and start writing in this language. Thank you for everything, Catherine, and to the people who make these studies available. Christian Keathley, Middlebury College, co-editor of [in]Transition: Journal of Videographic Film and Moving Image Studies, and editor of the Kino-Agora series at caboose books. [Film Studies For Free] honestly helped put [the Cinephiliacs] on the trajectory [it took], and I’m so excited for Catherine to celebrate this!!! Felicitaciones por este excelente trabajo, una fuente de recursos increíble para conocer el universo del ensayo audiovisual, por muchos años más!! 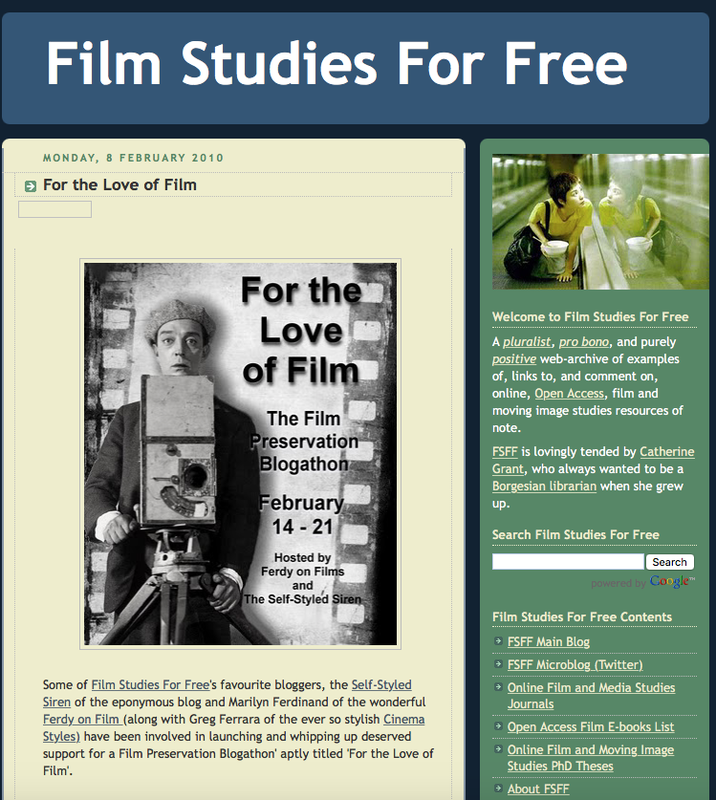 What an absolutely invaluable and generous resource [Film Studies For Free] has been for a decade. (A thousand thanks!) This morning I dug up my very first exchanges with [its author]--going back to the time when she founded FSFF--and (gulp) I found an email in which I urged her to join Facebook and friend me lol...which she kindly did. FSFF 4EVER! The generosity of the endeavour of [Film Studies For Free] in terms of the amount of scholarship it archives in topical and trending lists - and the invaluable resource it offers to film educators/researchers are what I most about it and what I love most about [its author]. 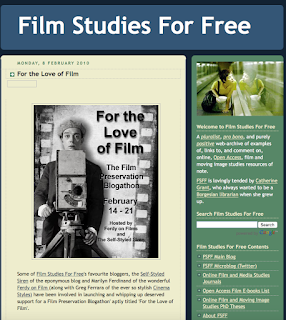 [Film Studies For Free] is my go-to resource for all things cinema studies. It's the best place online to find out what's happening in the world of academic film criticism. Joseph Tompkins, Allegheny College, editor of Film Criticism.